Veesible at latitudes atween +90° an −50°. 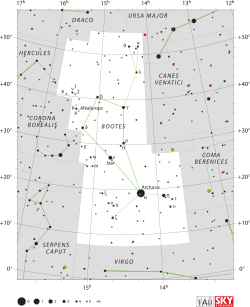 Boötes /boʊˈoʊtiːz/ is a constellation in the northren sky, locatit atween 0° an +60° declination, an 13 an 16 oors o richt ascension on the celestial sphere. ↑ Thompson & Thompson 2007, p. 102. ↑ 2.0 2.1 IAU, The Constellations, Boötes. This page wis last eeditit on 20 August 2015, at 15:20.